Smith & Wesson is expanding their very successful M&P Shield series with nine new models with longer slides and barrels. Offered in 9mm Luger, .40 S&W and .45 ACP, these mini “longslide” Performance Center Shields are also available from the factory with red dot sights. Each of the chamberings comes in three versions, a base model with a 4-inch slide and barrel assembly, an “optics ready” model which includes the mini red dot sight and a fully-equipped ported model which also comes with a factory red dot. All of the new Performance Center Shield pistols come with a green fiber optic front sight and red fiber optic rear sight. Also included with every gun is a Performance Center cleaning kit that comes with brushes, rods, nylon jags and a handful of patches to get started. Like other Shields, they come with one flush and one extended magazine. Capacity for the 9mm is 7+1 with the flush magazine or 8+1 with the extended mag and 6+1 or 7+1 in .40 S&W and .45 ACP depending on the magazine. None of the new models feature manual thumb safeties. With these guns it’s not just about added extras. These are Performance Center guns with tuned actions for better trigger feel. The triggers have an improved takeup and break and an enhanced, audible and tactile reset. Taken all together these pistols have multiple advantages over the stock Shield models. The lengthened barrel will provide better external ballistics, and the improved sights and longer sight radius mean faster, easier shots even at longer distances. These aren’t advantages that shine just in self-defense situations. 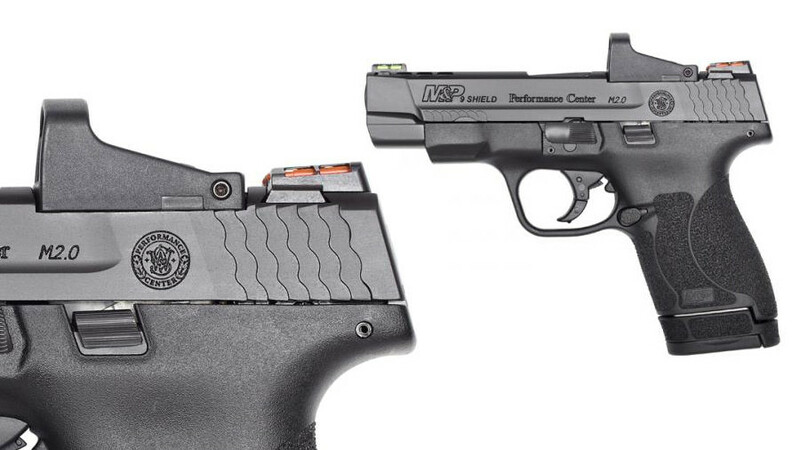 With these new Performance Center M&P Shields, Smith & Wesson is also offering factory race guns for competition shooters. As with the bulk of shooting sports back-up gun competitions are getting popular with a lot of shooters. Even someone who carries a basic Shield pistol can benefit from the practical shooting sports – these Performance Center models will give them a competitive advantage at the range. Like other Shield models they are still priced affordably, starting at $532 in 9mm, .40 and .45. Optics-ready models, which come with an installed 4-MOA sight, run $826 and the ported, optics-equipped model runs $854. As always, real-world and online pricing will be less. Smith & Wesson is working hard to make sure they have a Shield for everyone. Whether that’s for someone looking for a single-stack with all the bells and whistles or a back-up gun competitor looking for a factory gun that’s out-of-the-box ready for matches, Smith & Wesson is almost making it hard not to own a Shield. What has happened to the Smith & Wesson Performance Center, M&P, 5 inch, C.O.R.E., 9mm pistols. They are no longer listed on the web site and been difficult to find for almost a year. Maybe it will help American Outdoors Brand Corp (AOBC) , that is S&W stock, go up for once. 8 + 1…Why would you come out with a NEW conceal carry pistol and don’t adders the limited round capacity. Have you not heard of the Sig P365 9mm 13 + 1 capacity…..Dumb Even King Glock had to do a cheep fix to the G43 to remain relevant. Was excited about the new Shields till they got to the part about “NO THUMB SAFETY”! CANCEL MY INTERST.. Will wait for the new Sig 365, it will have a Thumb Safety and respectable capacity. Was told it should be avail at the beginning of summer! A few words concerning the reflex sight, its reticle size, the brand name, battery life, etc. would have been appropriate. I carry a Performance Center Shield in .40 every day, and for concealed carry, it’s perfect for me. I want this one though ! You failed to address the major drawback to the Shield pistols-Are the magazines still thumb breakers or has there been improvement? Bob, how did you break your thumb on a shield magazine? -The magazines are VERY difficult to load by hand. An UpLula helps. I have the original shield pc and love it!!! The thumb safety is a must for me, I automatically look for it no matter what I draw. Very disappointed there’s No thumb safety on any new models. Wanted a 4” so it’s goinf to have to be the compact 2.0.